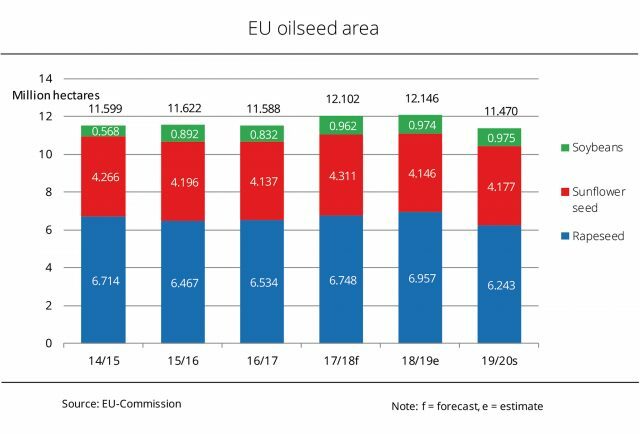 In Germany, UFOP reports that in the EU-28, fewer oilseeds are grown for the 2019 harvest than were planted for the previous year’s harvest. The EU Commission forecasts a total hectarage of 11.5 million for the 2019 harvest. According to the current estimate, this is down 6 per cent from the previous year and the smallest oilseed area in seven years. The key factor is the drop-in rapeseed area, whereas sunflowers are expected to rise. The main reason for the decline is the 10 per cent decrease in rapeseed area to 6.2 million hectares. Excessively dry conditions at the time of sowing prevented the sowing of rapeseed in many parts of Europe. Whereas the soybean area remains unchanged at approximately 1 million hectares, the EU Commission forecasts a slight expansion of sunflowers. However, at 0.7 per cent this is virtually insignificant. By contrast, according to Agrarmarkt Informations-Gesellschaft (mbH), the Commission’s estimate for the oilseed harvests is somewhat brighter. In other words, increases in rapeseed yield are expected to offset the decline in area. The anticipated rapeseed harvest of 19.9 million tonnes would be at the same level as the 2018 harvest. Sunflower production is provisionally projected slightly smaller at 10.1 million tonnes, but would still exceed the long-term mean by 7 per cent. The EU Commission’s crop estimate for soybeans is at the previous year’s level of 2.9 million tonnes.